The remains of North Witham Airfield can be seen within Twyford Forest, to the east of the A1 and south of the A151; Colsterworth being the nearest village in the north-west. 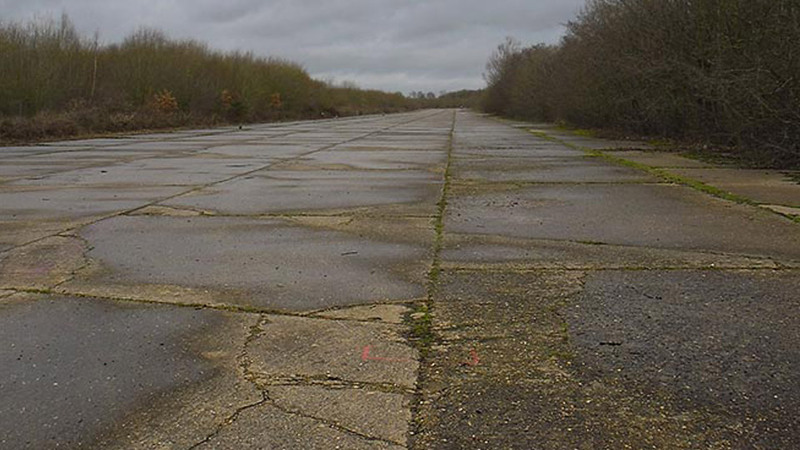 The airfield was built to the standard bomber pattern with three concrete runways and two T2 hangars, one on the technical side to the south-east of the airfield and the other off the north-west perimeter track. The communal and accommodation sites were dispersed to the south, along Honey Pot Lane and the bomb stores were located to the north-east of the airfield. (Pic: Phil Bonner). North Witham was allocated to the US Ninth Air Force and opened in the autumn of 1943 as Station 479 – specifically, the IX Troop Carrier Command (TCC). The US 1st Tactical Air Depot (TAD), a major transport aircraft distribution and maintenance unit, prepared and maintained C-47s and C-53s of the IX TCC. This also included Horsa and Hadrian Assault Gliders. During 1944, two Mobile Repair and Reclamation Squadrons (MRRS), 44th MRSS and 27th MRSS were also based at the airfield. In March 1944, IX TCC Pathfinder School (PFS) arrived at the airfield from RAF Cottesmore, Rutland. The C-47s of the school were equipped with Gee navigational equipment and radar allowing them to accurately drop pathfinder paratroopers. The advance party would then set up visual aids and a device called Eureka. This ground-based radar device could be picked up by the following C-47s in the main force. These were received with Rebecca receivers which picked up the Eureka signal, thereby accurately guiding the main body of the airborne troops to the drop zone. It was C-47s operating from North Witham which led invasion forces on D-Day, 20 aircraft being dispatched, one of which failed to return having been shot down. The PFS moved to Chalgrove, Oxfordshire between 10-14 September 1944, although C-47 maintenance continued at North Witham on a reducing scale. When the airfield was handed back to the RAF in early 1945, it was briefly placed on Care and Maintenance but by 1 June, it had been allocated to 40 (Maintenance) Group, for aircraft and ordnance storage. Most of the runways and perimeter track exist today, although parts are reduced in length and width and together with the bomb stores are surrounded by trees. The watch office still stands in a derelict state; the T2 hangar on the technical site is still in use by Witham Specialist Vehicles Ltd, for resale of former military vehicles.